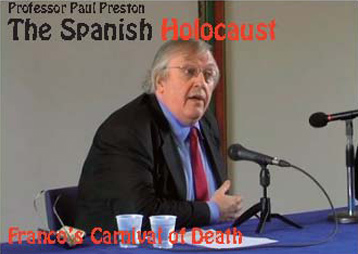 Hispanist historian Professor Paul Preston talks about his forthcoming, long-awaited new book (September 2011): The Spanish Holocaust: Inquisition and Extermination during the Civil War and After (El holocausto español. Odio y exterminio en la Guerra Civil y después), a definitive account of the murders and massacres of civilians that took place during and after the Spanish Civil War, which remains a sensitive and controversial topic three-quarters of a century after the start of the war. Author Paul Preston says the book proved to be his harshest challenge to date, both because of the vast scale of the subject matter and because of its harrowing nature. “The gratuitous cruelty it recounts ensured that it was an extremely difficult book to write,” says Preston, who is regarded as the world’s foremost historian of modern Spain. Preston, who is professor of modern Spanish history at the London School of Economics, makes a clear distinction between violence in the Republican and Francoist zones, both quantitively and qualitatively. The murders and semi-judicial massacres perpetrated by the fascist-backed rebels were almost always officially sanctioned and were an integral and carefully-planned part of their policy of terrifying the Spanish people into submission. By contrast, the killings in Republican-held Spain took place in the first few months of the war when law and order broke down and elements on the left, including s0-called ‘anarchists’, took spontaneous revenge on individuals and groups – such as the Church – who backed the July 1936 coup against the elected Republican government. Murders in the Republican zone, for which there is a reliable figure of 49,272, says Preston, were exhaustively investigated, both by the Republic before its defeat and by the victorious Francoists. The process of counting the victims of Francoist violence could only begin after the dictator’s death in 1975 and is still incomplete. “It is unlikely that such deaths were fewer than 150,000 and they could well be more,” says Preston. This figure excludes battlefield deaths on both sides, along with the unknown numbers killed in the bombing campaigns against Republican cities such as Madrid, Barcelona and Valencia. Nor does it include the many thousands of refugees who died in bombing attacks as they fled Francoist advances, nor the tens of thousands of refugees and prisoners who subsequently died from disease and malnutrition. “All of this constitutes what I believe can legitimately be called the Spanish Holocaust,” says Preston.